Learn how to crochet these cute mini Christmas hats, using a very easy to follow step by step video tutorial. There are many different kind of crochet and knitting patterns for mini Christmas hats and we’ve already made some of them on our blog. However, I think these mini hats with pom poms are the best of them. These stocking hats are so lovely, beautiful and fan to make that it’s almost impossible not to love them. That’s why today, we have decided to share with you some of the most helpful crochet tutorials that minutely explain each and every step of making these cuties in just a short period of time. 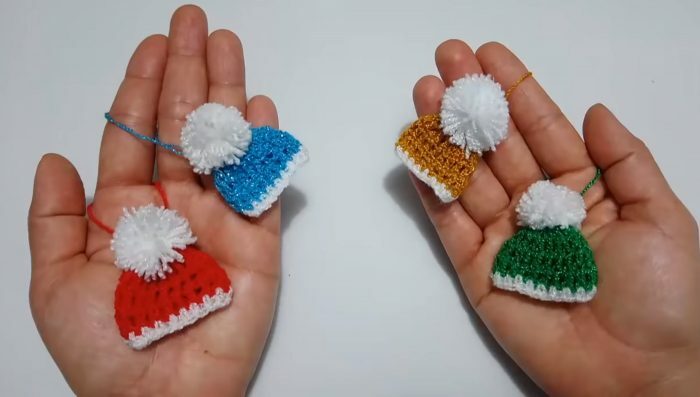 So, let’s make our Christmas tree much more colorful and eye-catching with these adorable mini crochet hats. Just follow the tutorials and you’ll be able to make this quick and easy project for yourself and for anyone dear to your heart. Enjoy yourself and do not forget to share your experience with us and other crochet lovers. Good luck and happy holidays. Here is a step by step tutorial by Rosa Isela on how to crochet these cute mini Christmas hats. The original tutorial isn’t in English, even so you can easily figure out how to work up these beautiful and simple mini hats. Good luck and happy crocheting.